Oleanders (Nerium oleander) are evergreen shrubs that are fast growing and showy. They are often grown along highways because they are beautiful and hardy. Oleanders have long, narrow, dark green leaves that are typically four to six inches long and less than an inch wide. The showy flowers are either single or double and range from white through yellow, peach, salmon and pink to deep burgundy red. They flower from summer to fall. Oleanders are drought tolerant and will even tolerate salty spray, making them useful for planting near the ocean. They are hardy in USDA zones 8 through 10, although they occasionally get frost bit in zone 8 and die back to the roots. They come back the next spring, however. Oleanders are extremely toxic. All parts are poisonous and contact with them can cause skin irritation and allergic reactions. Always wear long sleeves and gloves when handling oleanders. Oleanders are so poisonous that children have died from making a whistle from a twig. Adults have died from using a twig as a skewer to roast a hot dog. If any amount of the plant is ingested, contact poison control immediately. Even burning it can cause reactions to the smoke. Given how poisonous oleanders are, you may be wondering why anyone would plant them. They are drought and sea salt tolerant so are often planted along highways in beautification projects. They grow quickly, one to two feet a year, and can quickly become a thick hedge or a small tree. 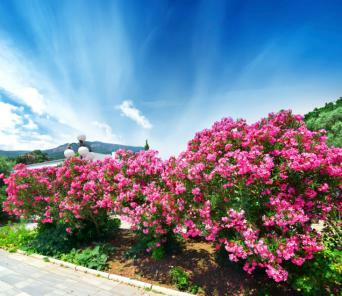 Most oleanders grow to be between eight and 12 feet tall and just as wide. Dwarf varieties stay three to five feet tall and just as wide. Occasionally, a protected tree may reach 20 feet. Their showy blossoms make them an ideal accent piece in the garden. Oleanders are generally purchased from the nursery as a small potted shrub. They can be planted in the fall or the spring. To plant them, pick a sunny area. They will even live in an area where heat radiates from a southern or western wall. 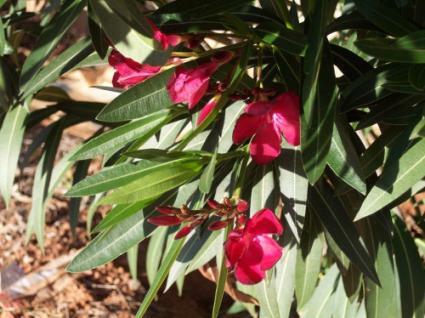 Oleanders will live in a variety of soils as long as they are well drained. They do not like wet feet. Dig a hole twice as wide but only as deep as the root ball. Carefully remove the plant from the pot and set it in the new hole. Fill in the hole then water in well. Add dirt after watering in to make sure that there is sufficient dirt to cover the entire root ball. Oleanders need about an inch of water a week until established, then are very drought tolerant. However, they will produce prettier and more flowers if they are watered. The first year in the spring, fertilize with a balanced fertilizer such as a 10-10-10. After that, oleanders do not require fertilization. Oleanders are propagated from cuttings. You cut about six inches off the tip. Remove the lower leaves and cut the upper leaves to about an inch long. Place in water on a sunny windowsill. In about two weeks, the cutting will develop roots. It is then ready to be planted in potting soil. It takes about a year for the plant to reach gallon size. 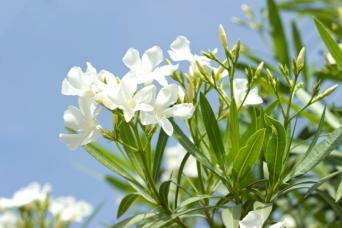 Even though oleanders are drought tolerant, they should be watered one inch a week for best foliage and growth. Do not over water. If the leaves turn yellow, you are over watering the plant. Deadheading the plant will prolong blooming and keep the plant looking neat. Place spent blooms where children and animals cannot reach them, and not in the compost pile. You also need to prune the plant. You prune oleanders to shape the shrubs and to force more branching. Each branch has flowers, so the more branches, the more flowers. Oleanders should be pruned in September into early October. Any later will cause a flush of new growth that will be damaged in the winter. The International Oleander Society has a good explanation of pruning on its website. Botryosphaeria dieback, which is caused by the fungus Botryosphaeria, can make branches and shoots die and turn a blackish brown color. It is more likely to attack shrubs who are drought stressed or subjected to severe freezes. To treat, trim the effected branches at least four inches below the fungus. Then spray your shrub with a copper fungicide formulation as a preventative. The oleander caterpillar is a serious insect pest of the oleander. Caterpillars feed in groups and can strip a tree bare of its leaves in a week or so. Although this defoliation will not kill an adult shrub, it can weaken it and make it vulnerable to other insects and diseases. Bt pesticide (Bacillus thuringiensis) can be sprayed on the caterpillars to kill them. This is an organic product that will not hurt beneficial insects. Aphids, mealybugs, and scales can also be problematic. These can be dealt with by treating the shrub with insecticidal soap or Neem oil. Make sure you cover every surface of the plant, including under the leaves, to effectively remove these pests. Oleanders are often sold by color rather than by cultivar. However, these are some good choices for home gardens. If you want single, dark red flowers you should choose 'Algiers.' It grows to a height of eight to 10 feet. A tall tree that grows 10 to 18 feet tall, 'Calypso' is cold hardy and has single cherry red flowers. The hardiest cultivar of oleander is 'Hardy Red.' It grows to be eight feet tall so is good for hedges. It has single, cherry red flowers. If you prefer pink to red, choose 'Hardy Pink.' It has most of the features of 'Hardy Red,' but with salmon pink flowers. If you need a yellow flowered oleander, choose 'Matilde Ferrier.' It is often sold as 'Double Yellow,' and will fit the bill. It is a tall oleander, growing to be eight feet. Two good dwarf oleanders are 'Petite Salmon' and 'Petite Pink.' They will stay three to four feet tall if lightly pruned but are less cold hardy than full size oleanders. If you are in search of a white oleander, you should buy 'Sister Agnes,' often sold as 'White Oleander.' It grows ten to 12 feet tall and is very vigorous. Oleanders are beautiful, hardy shrubs that require little maintenance once they are established. They provide a striking accent piece in the garden. However, they are very poisonous, so should not be planted where children or pets can reach them.